About 270 Minnesota newspapers participate in this discount program. With one order, you run a 2-column by 2-inch, 4-inch, or 8-inch ad in each participating newspaper, either statewide or in a selected region(s). How big of a discount? A statewide 2×2 is valued at $14,380 and sold at $2,500, and a statewide 2×4 is worth $28,760 and sells for $5,100 – both rates are about only 17% of what it would cost to place the ad in each paper individually. CPMs are only $2.33/m and $4.75/m respectively – the 2×2 program reaches about 4 households per penny. A further discount is available by buying 3 consecutive weeks and the 4th is free (must be same ad copy). Income is split between all the participating newspapers and the Minnesota Newspaper Association (MNA), which runs the network. The program is meant for larger advertisers needing to reach a large area, who most newspapers would not have an opportunity to deal with directly. Only 8 ads per region are allowed each week at this rate. Ads must be paid in advance, and this reserves your position. If the maximum number of ads is exceeded, a waiting list is created. What are the content requirements? Advocacy and political ads are not allowed in this program. Both the program association and each individual newspaper reserve the right to reject any advertising as they see fit. How do I know my ad will run? Historically, the program has a very high run rate, well over 90%. Although it is impractical to provide proof of each individual publication, MNA will supply a tearsheet from one newspaper and an affidavit for each week an ad runs. MNA does monitor each paper’s compliance of running all ads. Of course, ads need good copy and graphic appeal, but most of our customers get very good results. Newspaper readers are the most engaged people in their communities, the best demographic to seek. Newspapers remain the most effective way to reach a broad audience, both in terms of cost and credibility. 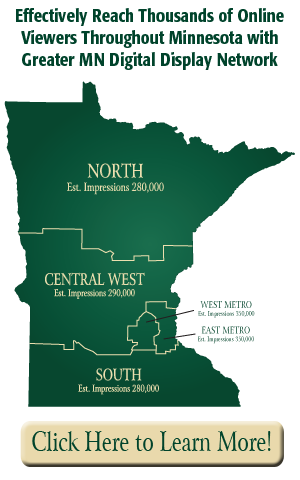 Just call – Greater Minnesota Communications/Herald Journal is an authorized marketing agent for this program, and we’ll get all the details in place for you, including designing your ad if you need. Deadline for placement is early Tuesday mornings for publication the following week. This is the official program operated by the Minnesota Newspaper Association; marketed by Herald Journal Publishing. Copyright © 2019 Statewide Newspaper Advertising in Minnesota. All rights reserved.